Haida Gwaii’s small population of northern goshawks — already of great concern to conservationists — are the last remnant of a highly distinct genetic cluster of the birds, according to a new genomic analysis by University of British Columbia researchers. “Goshawks across the British Columbia Coast appear to be declining, however, the distinct Haida Gwaii population is at a particularly high risk of extinction with such a small population size,” says Kenneth Askelson, a researcher with the UBC Department of Zoology and Biodiversity Research Centre, who co-led the study. Latest counts puts the population on the archipelago at roughly 50. The genomic findings add new context and impetus to efforts to save this vulnerable pocket of goshawks, which are one of BC’s most iconic birds of prey. The diminishing population of northern goshawks across British Columbia’s Coast (estimated at roughly 1,200 within B.C. ), and continued habitat loss, have led to the laingi subspecies being listed as threatened under the Canadian Species at Risk Act. But debate over which individual northern goshawks should be considered part of the threatened laingi subspecies — and the crucial question of what geographic areas should be considered within their range — has complicated conservation efforts. The paper, published today in Evolutionary Applications, is one of the first to use genomics to inspect biodiversity on Haida Gwaii. “This underscores the importance of conservation-related studies of genetic variation — too often, biodiversity vanishes invisibly,” says Armando Geraldes, who co-led the study with Askelson. The researchers estimate the distinct population of birds may have been evolving separately on Haida Gwaii for 20,000 years. Percy Algernon Taverner (a prominent Canadian ornithologist) was the first to describe the laingi goshawk on Haida Gwaii in 1940 — identifying them as darker than other examples of the bird. “There may be many unique subspecies that occur only on Haida Gwaii — an indication that the area is a very unique biogeographic region with many distinct lineages of species that have been poorly studied,” says Askelson. Active leftists of various groups demonstrated peacefully against fascism, exploitation, imperialism and war on January 13, 2019 in Berlin. 100 years ago, Rosa Luxemburg and Karl Liebknecht fought this fight and died. A big thank you to all active leftists who continue this fight. Today marks the centenary of one of the most horrific and consequential crimes in world history. In Berlin on 15 January, 1919, Freikorps soldiers of the Garde-Kavallerie-Schützen Division arrested Rosa Luxemburg and Karl Liebknecht, the two leaders of the German Communist Party (KPD), which had been founded just two weeks earlier. Soldiers transported them to the Hotel Eden, where they were tortured before being taken away and murdered. For Luxemburg, the overcoming of all forms of oppression was inseparably bound up with the overthrow of the capitalist system. The first ever video of the rare Texas Blind Salamander in the wild. For the new study, Hillis and other researchers delineated the geographic ranges of more than a dozen Central Texas groundwater salamander species by studying the genetics of preserved specimens, collected over several decades and stored in the University of Texas Biodiversity Collections. First author Tom Devitt, currently an environmental scientist with the City of Austin’s Watershed Protection Department, carried out the genetic analyses while still a postdoctoral researcher at UT Austin working with Hillis, helping to identify the three species previously unknown to science. The CIPD and the High Pay Centre have undertaken their annual assessment of FTSE CEO pay packages. In this short video we summarise the approach we took and highlight some of the key findings of the report. A new report into the pay gap between workers and the ruling elite has laid bare the extreme levels of inequality that pervade economic and social life in the UK. According to research carried out by the High Pay Centre (HPC) and the Chartered Institute of Personnel and Development (CIPD), within the first three working days of January, the highest paid Financial Times Stock Exchange (FTSE) 100 bosses had already raked in as much money as the average full-time worker will earn in a year. New research for “Fat Cat Friday” found that by lunchtime on January 4, top executives had already made the UK median annual salary of £29,574, needing only to work 29 hours, at a rate of around £1,020 an hour. This means that over the course of the year, the median FTSE 100 CEO will earn approximately £3.9 million. This equates to 133 times the annual pay of a full-time worker, up 11 percent on the previous year, when FTSE 100 CEOs had a median pay packet of approximately £3.5 million. This represented a salary 120 times higher than the average UK worker at the time. The economic gulf separating the working class and the super-rich has massively expanded in recent years, creating inequality on a scale unseen for almost a century. While today top executives earn 133 times the salary of the average worker, this has rocketed up since 1998, when the ratio stood at roughly 47 to 1. 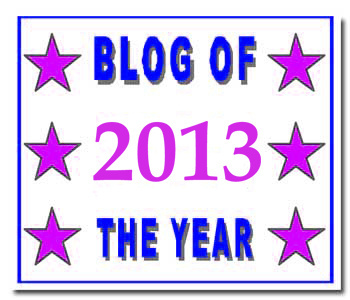 This represents a pay gap increase of a staggering 183 percent in 20 years. According to the CIPD and HPC’s report from August 2018, FTSE 100 CEOs’ mean pay saw an even bigger increase—jumping a massive 23 percent in a year—from £4.6 million in 2016 to £5.7 million in 2017 (the latest year for which figures are available). While top executives have seen their annual pay grow rapidly year on year, for the vast majority of Britons the picture is very different. Workers in the UK have suffered a decline in wages unsurpassed for over a century, falling further than any European country except Greece. At least 6 percent of the workforce is on zero-hour contracts, rising from 1.7 million to 1.8 million in 2017. Over 14 million people, including 4.5 million children, one-third of all children, live below the poverty line. More than two-thirds comprise the “working poor”. At least 320,000 people are homeless, meaning 1 in every 200 adults is without a permanent place to live. At least one person dies on the streets each day, yet the majority of homeless are in employment. While many workers struggle to meet their basic living costs on poverty wages, corporate executive remuneration has shot up, with the highest paid FTSE 100 CEO, Jeff Fairburn of housebuilding firm Persimmon Plc, receiving an obscene salary of £47.1 million in 2017. This is more than 20 times his pay packet the previous year, and roughly 1,130 times the average (mean) pay of his company’s employees. On top of this, Fairburn pocketed a £75 million bonus in mid-2018, supposedly awarded for “outstanding performance”. The Guardian calculated that this is more than enough to house all 760 homeless families in the Yorkshire and Humber region where the firm is based, with around £15 million to spare. Fairburn was eventually forced to step down from his position, as the media controversy surrounding his pay packet was negatively affecting the company’s reputation. Simon Peckham, CEO of Melrose Industries, also received a massive pay boost, with his pay packet rising a staggering 4,233 percent, from roughly £987,000 in 2016 up to £42.8 million in 2017. These enormous income windfalls are not just reserved for FTSE 100 companies. In 2017, Denise Coates, CEO of online gambling site Bet365, became Britain’s highest paid boss, raking in a staggering £265 million. This was up from £199 million the year before, based on salary and perks, and is nearly 10,000 times more than the average UK salary. Frances O’Grady, general secretary of the Trades Union Congress (TUC), commented: “There are millions of hardworking people in Britain who give more than they get back, but greedy executives are taking more than they’ve earned. Social inequality is not some aberration of capitalism that can be reformed away, but is its essential feature. Capitalism is predicated upon the exploitation of the working class in order to ensure the profits of the corporate and financial oligarchy and is incapable of providing economic security and a decent standard of living for working people. Society must be reorganised along socialist lines, so that the accumulation of wealth is subordinated to the needs and requirements of its producers and users, controlled and regulated by them. Thin layer of the UK population earn more than £150,000 per year: here. In a massive display of social opposition, more than 50,000 teachers, school personnel, parents and students marched in downtown Los Angeles Monday on the first day of the strike by educators in the nation’s second largest school district. The walkout by more than 33,000 educators, the first in the city since 1989, is part of the growing wave of working class struggles in the US and internationally against austerity and social inequality. Monday morning began with teachers and their supporters picketing over 900 public schools across the Los Angeles Unified Schools District (LAUSD), a vast area that spans an estimated 920 square miles. 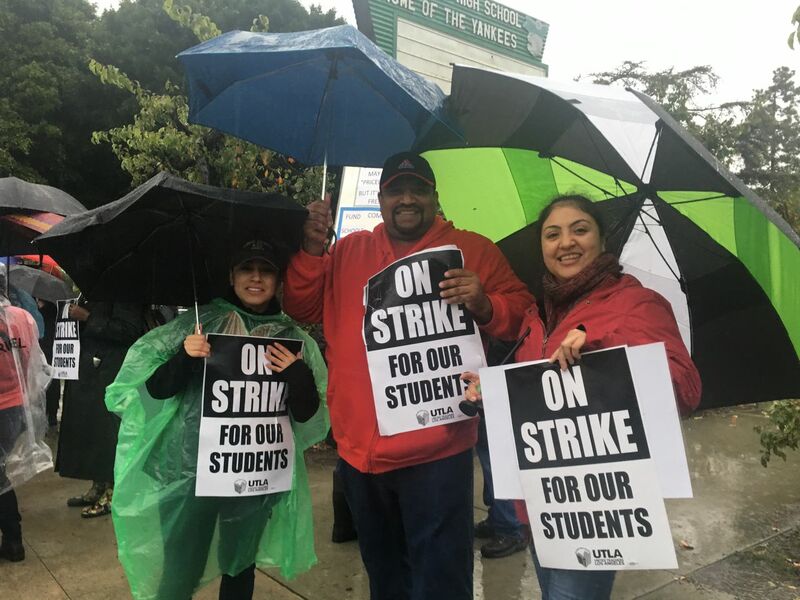 Despite the pouring rain, striking teachers were joined on the picket lines by an estimated 10,000 parents, students and other community supporters. After picketing in the morning, teachers and their supporters got on Metro trains and rode them to Grand Park station in downtown Los Angeles. Tens of thousands poured out of the station and gathered in the park and on the steps of city hall. They then marched in a mile-long throng to the LAUSD headquarters on Beaudry Avenue. In comments to the press Monday, LAUSD Superintendent Austin Beutner made the absurd claim that only 3,500 teachers had marched downtown and that substitutes brought in as strikebreakers had carried out a “normal school day”. Photographs taken by the Los Angeles Times, however, showed near empty school auditoriums where the handful of students sat throughout the school day. 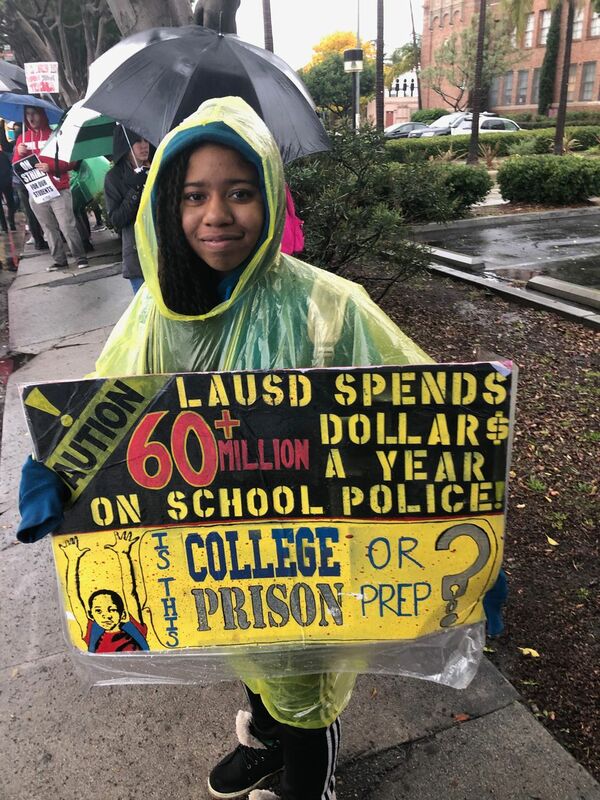 The struggle in Los Angeles is a battle against the powerful financial and political interests that are pushing for the privatization of public education across the US. Beutner, a former investment banker, was appointed by school board officials whose elections were funded by the Eli Broad Foundation and other billionaire school privatizers. The strike has won overwhelming popular support, with messages of solidarity flowing in from teachers across California, the US and internationally. Like their counterparts in LA, school officials in Oakland claim they are facing insolvency due to health care and pension obligations and are pushing for the closure of one-third of the district’s schools while expanding charters. Three thousand teachers, parents and students marched Saturday to oppose privatization and demand improved wages and school funding. Beutner’s campaign to expand for-profit charter schools and privatization, however, has the full backing of both corporate-controlled parties. This was underscored by the statements on the eve of the strike. President Obama’s education secretary, Arne Duncan, weighed in to denounce the Los Angeles teachers’ demands as unreasonable. In a statement on the strike Monday, newly inaugurated Democratic Governor Gavin Newsom … made it clear he had no sympathy for the teachers’ demands and echoed Beutner’s self-serving statements that the teachers were hurting students by striking. In his budget proposal Newsom, whose political career was funded by the billionaire Getty, Pritzker and Fisher families, has proposed no increase in per pupil spending, despite the fact that the state is rated 43rd in the nation. Instead, he has said he would follow the “fiscally prudent” model of his Democratic predecessor, Jerry Brown, who made some of the deepest public education cuts in state history. Well aware that teachers are determined to fight school privatization and worsening social inequality, UTLA President Alex Caputo-Pearl, in a morning rally, railed against “billionaire privatizers” and called for a mass protest in front of the California Charter School Association on Tuesday. He said the attack on public education came from every level of government. Although there is widespread support for teachers from every section of workers, the Service Employees International Union (SEIU) is instructing its members, including school bus drivers, custodians and cafeteria, to scab on the strike. 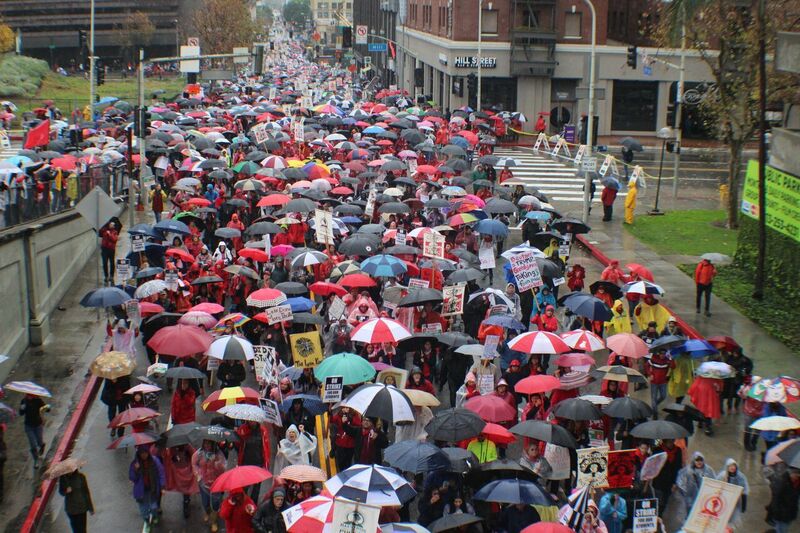 The UTLA has also told its 1,000 members who are charter school teachers to continue to work. It is impossible for Los Angeles teachers to fight the powerful corporate and political forces arrayed against them on their own. To spread the strike throughout the state, teachers must … form rank-and-file strike committees to reach out to educators across California, nationally and internationally. Rank-and-file committees should outline their own demands, including a 30 percent wage increase and the reconversion of all charter schools into public schools, and oversee all negotiations. Teachers should appeal to support staff and charter school teachers to … join the strike. They should also reach out to other sections of workers—locked-out federal workers, Amazon, UPS and other logistics workers, oil refinery workers, dock workers, telecom, tech and manufacturing workers—to build up support for a general strike to fight austerity and social inequality. 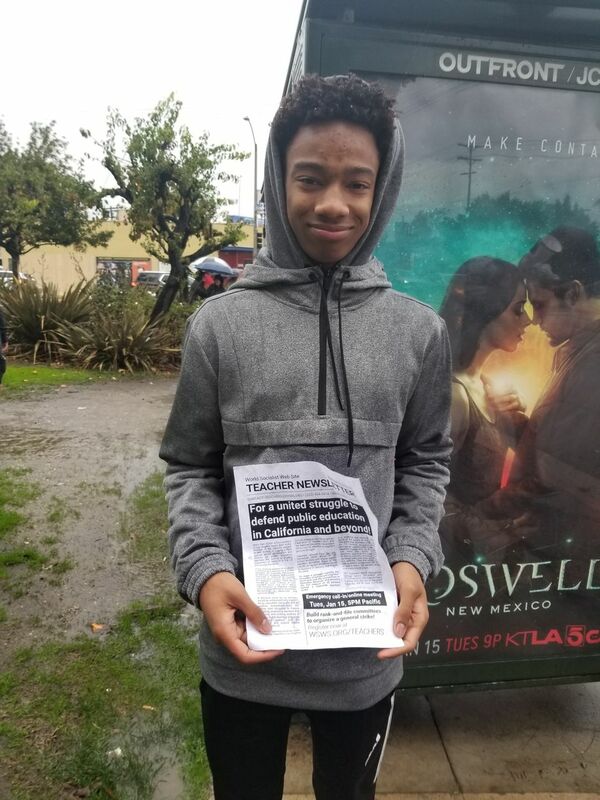 Los Angeles students dropped their books and picked up picket signs to march alongside their teachers striking against the Los Angeles Unified School District. Some told us why they skipped school to join their teachers on the picket lines. More than 33,000 school teachers in the Los Angeles Unified School District, the nation’s second largest, went on strike Monday. 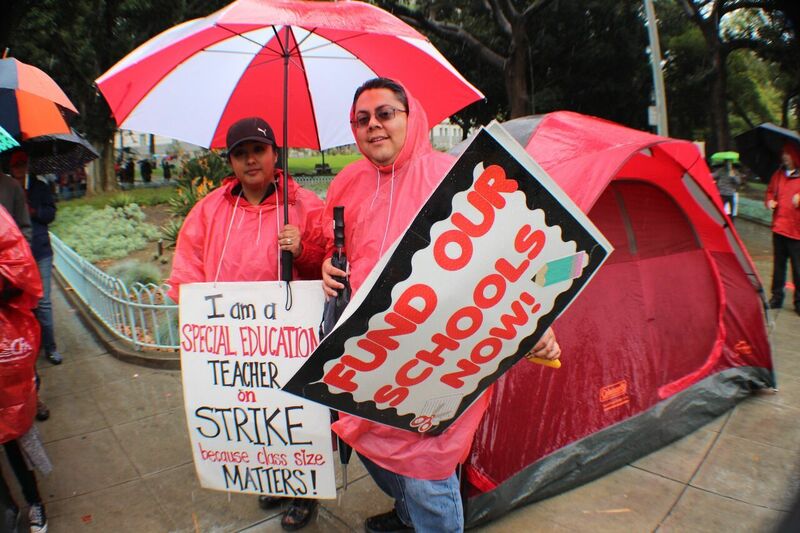 Reporters from the World Socialist Web Site spoke to many teachers at strike locations and at a mass march and rally in downtown Los Angeles attended by more than 50,000 teachers, parents, students and their supporters. Like their counterparts who struck in West Virginia and other states last year, teachers and their supporters wanted to talk about the broader political issues behind the attack on public education, including the complicity of the Democrats who control every level of government in Los Angeles and California, and the explosive growth of social inequality in America. Many supported the call by the WSWS Teacher Newsletter to broaden the fight into a statewide and national strike by teachers and all workers against austerity and social inequality. During morning picketing at Hamilton High School in West Los Angeles, Nancy, who has been teaching for five years, said, “We don’t have a full-time nurse in our school or enough counselors. The ratio is one for every 500 students. Our classes are too crowded and we’re working with different learning disabilities. We are fighting for more teachers in our classrooms because education is primary. Referring to the comments of Arne Duncan, President Obama’s education secretary, who said the Los Angeles teachers’ demands were unreasonable, David said, “I’d like to see him walk in our shoes and work in our classrooms. But they just follow the corporate line because it benefits him. “But we’re making a last stand, being the second largest school district in the country, we have to fight this fight. We got pushed into this fight. It would be great to expand this to the Oakland teachers and elsewhere because there is power in numbers. “The money is consolidated in so few hands, it just goes to their greed glands. The same issues facing teachers are the same for all labor no matter what country we’re in. Wherever people are having to work for a living and are unfortunately living from paycheck to paycheck, they are exploited and being taken advantage of. A foreign language teacher added, “They treat us like they are doing us a favor to grant us pay raises. That’s a joke because people are fighting for the minimum requirement and to have a respectful environment to work in. They’re not doing us a favor. This is the basics, and this strike should have been done years ago. 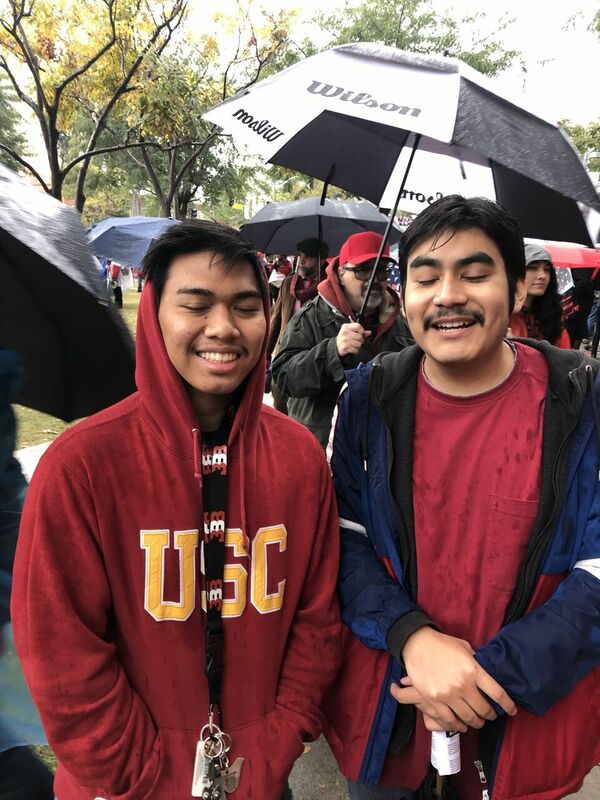 Calvin, a junior at Hamilton High School, said, “I’m out here to support the teachers fight for what’s right for us. I really want to get politically involved with their fight. I know that a lot of my classmates want to get politically involved as well. WSWS reporters also spoke to several students at the downtown demonstration and at surrounding area schools. Lamuel and Eduardo attend Belmont High School, located north of the Los Angeles city center. They are both seniors. They were at the rally to support the teachers along with Lamuel’s mother, who is a biology teacher at Belmont High School. “One of the big issues in my school is the number of students in each class,” said Lamuel. “In my AP English Lit class there are more than fifty students. Other classes have between 45 and 50 students. Lamuel’s friend Eduardo spoke about the conditions in Los Angeles schools. “At the beginning of the school year there were no desks for all the students in our English lit class. They had to sit on the side. Conrad, a special education teacher at Hamilton, expressed disgust over the failed efforts by the district last week to place an injunction on special education teachers, thereby preventing them from participating in the strike. 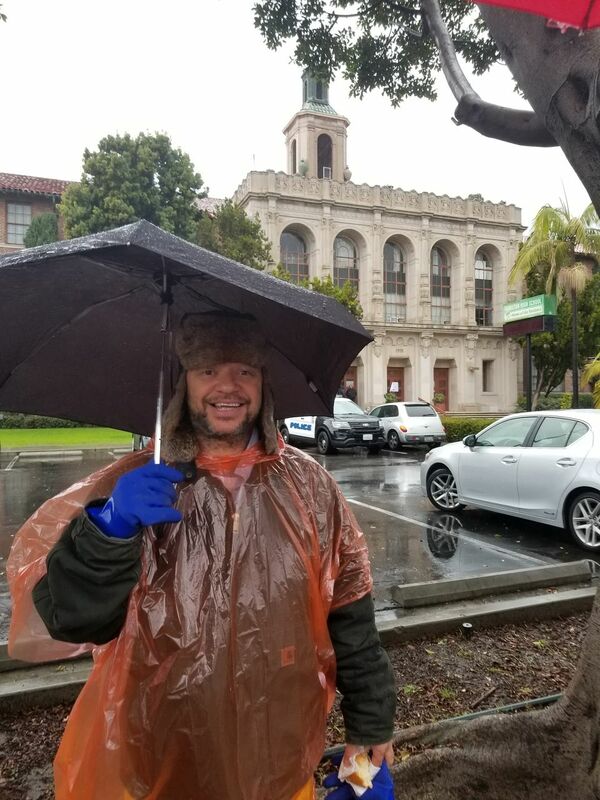 Asked about what he thought about the teachers’ struggle in Oakland, Conrad said, “I actually grew up in that area and have two friends who are Oakland teachers. Just last night we texted, and they wished me the best of luck. They told me ‘we’re watching you very closely, the whole world’s watching you. Good luck.’ Some teachers in San Francisco said they want to come down and be with us. Also at the downtown demonstration was Aida, a teacher at Normont Elementary for 11 years. She is a special needs resource teacher and said the difficulties her students and staff faced brought her out to the strike. 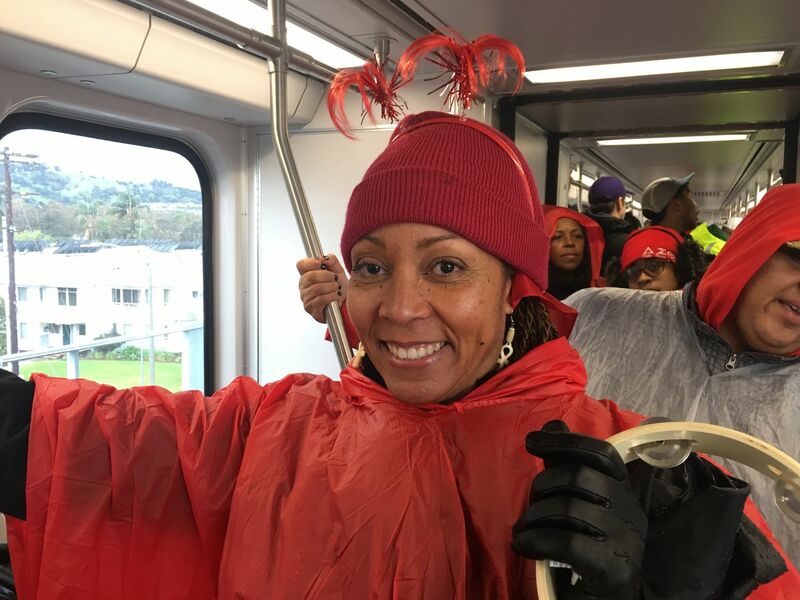 En route to the downtown march on the metro train system, Stacy, a veteran of the Los Angeles teachers’ last strike three decades ago told the WSWS, “I was on the line in 1989 and have been teaching for 33 years. For us, our school has a charter school co-located on our campus. The charter school took away our art room, music room and computer lab, and now we’re cramming kids into small spaces, and its completely unfair. From overcrowding and unfair wages, and not doing right by our children, something has got to change. As 33,000 Los Angeles teachers began walking picket lines on Monday, simmering anger over continuing underfunded education, poor pay, diminishing pensions and chronic teacher shortages is already beginning to come to a boil in other school districts around the US. Teachers in Denver, Colorado will decide by the end of this week if they will strike against the Denver Public Schools (DPS). Teachers have been attending open negotiating sessions, holding strike preparation meetings and speaking to parents over the last week: here. This December 2018 video shows a male pintail duck swimming and cleaning his feathers. Harry Brummelhuis made this video in the Vreugderijkerwaard near Zwolle in the Netherlands.